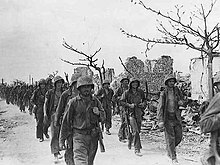 The Battle of Saipan was a battle of the Pacific campaign of World War II, fought on the island of Saipan in the Mariana Islands from 15 June to 9 July 1944. The Allied invasion fleet embarking the expeditionary forces left Pearl Harbor on 5 June 1944, the day before Operation Overlord in Europe was launched. The U.S. 2nd Marine Division, 4th Marine Division, and the Army's 27th Infantry Division, commanded by Lieutenant General Holland Smith, defeated the 43rd Infantry Division of the Imperial Japanese Army, commanded by Lieutenant General Yoshitsugu Saito. The loss of Saipan, with the death of at least 29,000 troops and heavy civilian casualties, precipitated the resignation of Japanese Prime Minister Hideki Tōjō and left the Japanese mainland within the range of Allied B-29 bombers. LVTs heading for shore on 15 June 1944. Birmingham in foreground; the cruiser firing in the distance is Indianapolis. In the campaigns of 1943 and the first half of 1944, the Allies had captured the Solomon Islands, the Gilbert Islands, the Marshall Islands and the Papuan Peninsula of New Guinea. This left the Japanese holding the Philippines, the Caroline Islands, Palau Islands, and Mariana Islands. It had always been the intention of the American planners to bypass the Carolines and Palauan islands and to seize the Marianas and Taiwan. From these latter bases, communications between the Japanese archipelago and Japanese forces to the south and west could be cut. From the Marianas, Japan would be well within the range of an air offensive relying on the new Boeing B-29 Superfortress long-range bomber with its operational radius of 1,500 mi (2,400 km). While not part of the original American plan, Douglas MacArthur, commander of the Southwest Pacific Area command, obtained authorization to advance through New Guinea and Morotai toward the Philippines. This allowed MacArthur to keep his personal pledge to liberate the Philippines, made in his "I shall return" speech, and also allowed the active use of the large forces built up in the southwest Pacific theatre. The Japanese, expecting an attack somewhere on their perimeter, thought an attack on the Caroline Islands most likely. 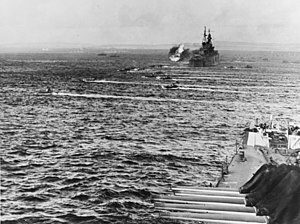 To reinforce and supply their garrisons, they needed naval and air superiority, so Operation A-Go, a major carrier attack, was prepared for June 1944. Navajo codetalkers played a key role in directing naval gunfire onto Japanese positions. 104th Field Artillery Bttn., 105th Field Artillery Bttn., 106th Field Artillery Bttn., 249th Field Artillery Bttn. 102nd Engineer Combat Bttn., 502nd Engineer Combat Bttn. Holding a Colt M1911, a Marine moves cautiously through the jungle of Saipan. July 1944. The bombardment of Saipan began on 13 June 1944. 15 battleships were involved, and 165,000 shells were fired. Seven modern fast battleships delivered 2,400 16 in (410 mm) shells, but to avoid potential minefields, fire was from a distance of 10,000 yd (9,100 m) or more, and crews were inexperienced in shore bombardment. The following day the eight older battleships and eleven cruisers under Admiral Jesse B. Oldendorf replaced the fast battleships but were lacking in time and ammunition. The landings began at 07:00 on 15 June 1944. 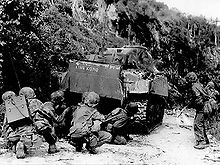 More than 300 LVTs landed 8,000 Marines on the west coast of Saipan by about 09:00. Eleven fire support ships covered the Marine landings. The naval force consisted of the battleships Tennessee and California, the cruisers Birmingham and Indianapolis, the destroyers Norman Scott, Monssen, Coghlan, Halsey Powell, Bailey, Robinson, and Albert W. Grant. Careful artillery preparation — placing flags in the lagoon to indicate the range — allowed the Japanese to destroy about 20 amphibious tanks, and they strategically placed barbed wire, artillery, machine gun emplacements, and trenches to maximize the American casualties. However, by nightfall, the 2nd and 4th Marine Divisions had a beachhead about 6 mi (10 km) wide and 0.5 mi (1 km) deep. The Japanese counter-attacked at night but were repulsed with heavy losses. On 16 June, units of the U.S. Army's 27th Infantry Division landed and advanced on the airfield at Ås Lito. Again the Japanese counter-attacked at night. On 18 June, Saito abandoned the airfield. The invasion surprised the Japanese high command, which had been expecting an attack further south. Admiral Soemu Toyoda, Commander-in-Chief of the Imperial Japanese Navy (IJN), saw an opportunity to use the A-Go force to attack the U.S. Navy forces around Saipan. On 15 June, he gave the order to attack. But the resulting battle of the Philippine Sea was a disaster for the IJN, which lost three aircraft carriers and hundreds of planes. The garrisons of the Marianas would have no hope of resupply or reinforcement. By 7 July, the Japanese had nowhere to retreat. Saito made plans for a final suicidal banzai charge. On the fate of the remaining civilians on the island, Saito said, "There is no longer any distinction between civilians and troops. It would be better for them to join in the attack with bamboo spears than be captured." At dawn, with a group of 12 men carrying a great red flag in the lead, the remaining able-bodied troops — about 3,000 men — charged forward in the final attack. Amazingly, behind them came the wounded, with bandaged heads, crutches, and barely armed. The Japanese surged over the American front lines, engaging both Army and Marine units. The 1st and 2nd Battalions of the 105th Infantry Regiment were almost destroyed, losing 650 killed and wounded. However, the fierce resistance of these two battalions, as well as that of Headquarters Company, 105th Infantry, and of supply elements of 3rd Battalion, 10th Marine Artillery Regiment, resulted in over 4,300 Japanese killed. For their actions during the 15-hour Japanese attack, three men of the 105th Infantry were awarded the Medal of Honor — all posthumously. Numerous others fought the Japanese until they were overwhelmed by the largest Japanese Banzai attack in the Pacific War. By 16:15 on 9 July, Admiral Turner announced that Saipan was officially secured. Saito, along with commanders Hirakushi and Igeta, committed suicide in a cave. Vice-admiral Chuichi Nagumo, the naval commander who led the Japanese carriers at Pearl Harbor, also committed suicide in the closing stages of the battle. He had been in command of the Japanese naval air forces stationed on the island. In the end, almost the entire garrison of troops on the island — at least 29,000 — died. For the Americans, the victory was the most costly to date in the Pacific War: out of 71,000 who landed, 2,949 were killed and 10,464 wounded. Future Hollywood actor Lee Marvin was among the many Americans wounded. He was serving with "I" Company, 24th Marine Regiment, when he was hit by shrapnel in the buttocks by Japanese mortar fire during the assault on Mount Tapochau. He was awarded the Purple Heart and was given a medical discharge with the rank of private first class in 1945. While the battle officially ended on July 9, Japanese resistance still persisted with Captain Sakae Ōba and 46 other soldiers who survived with him during the last banzai charge. After the battle, Oba and his soldiers led many civilians throughout the jungle of the island to escape capture by the Americans, while also conducting guerrilla-style attacks on pursuing forces. The Americans tried numerous times to hunt them down but failed due to their speed and stealth. In September 1944, the Marines began conducting patrols in the island's interior, searching for survivors who were raiding their camp for supplies. Although some of the soldiers wanted to fight, Captain Ōba asserted that their primary concerns were to protect the civilians and to stay alive to continue the war. 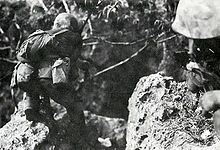 At one point, the Japanese soldiers and civilians were almost captured by the Americans as they hid in a clearing and ledges of a mountain, some were less than 20 feet (6.1 m) above the heads of the Marines, but the Americans failed to see them. Oba's holdout lasted for over a year (approximately 16 months) before finally surrendering on December 1, 1945, three months after the official surrender of Imperial Japan. Oba was so successful in his resistance that the Marines nicknamed him the "Fox", and once even caused the reassignment of a commander. Being a former Spanish and then German territory, Saipan became a Mandate of Japan by the League of Nations after World War I, and thus, a large number of Japanese civilians lived there — at least 25,000. 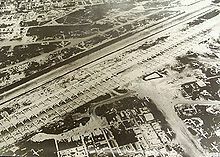 The U.S. erected a civilian prisoner encampment on 23 June 1944 that soon had more than 1,000 inmates. Electric lights at the camp were conspicuously left on overnight to attract other civilians with the promise of three warm meals and no risk of accidentally being shot in combat. Weapons and the tactics of close quarter fighting also resulted in high civilian casualties. Civilian shelters were located virtually everywhere on the island, with very little difference noticeable to attacking marines. The standard method of clearing suspected bunkers was with high-explosive and/or high-explosives augmented with petroleum (e.g., gelignite, napalm, diesel fuel). In such conditions, there were high civilian casualties. Emperor Hirohito personally found the threat of defection of Japanese civilians disturbing. Much of the community was of low caste, and there was a risk that live civilians would be surprised by generous U.S. treatment. Native Japanese sympathizers would hand the Americans a powerful propaganda weapon to subvert the "fighting spirit" of Japan in radio broadcasts. At the end of June, Hirohito sent out an imperial order encouraging the civilians of Saipan to commit suicide. The order authorized the commander of Saipan to promise civilians who died there an equal spiritual status in the afterlife with those of soldiers perishing in combat. General Hideki Tōjō intercepted the order on 30 June and delayed its sending, but it went out anyway the next day. By the time the Marines advanced on the north tip of the island, from 8–12 July, most of the damage had been done. More than a 1,000 Japanese civilians committed suicide in the last days of the battle to take the offered privileged place in the afterlife, some jumping from places later named "Suicide Cliff" and "Banzai Cliff". These would become part of the National Historic Landmark District as Landing Beaches; Aslito/Isley Field; & Marpi Point, Saipan Island, designated in 1985. Today the sites are a memorial and Japanese people visit to console the victims' souls. On 16 June 1944, Gunnery Sergeant Robert H. McCard, a U.S. Marine, killed sixteen enemies while sacrificing himself to ensure the safety of his tank crew. McCard was posthumously awarded the Medal of Honor for his actions. The USS Robert H. McCard (DD-822), a Gearing-class destroyer, was named in his honor. On 25 June 1944, PFC Harold G. Epperson, part of the 2nd Marine Division, threw himself on a grenade to contain the blast from killing members of his squad. For his bravery and sacrifice, PFC Epperson was posthumously awarded the Medal of Honor. Epperson's Medal of Honor was presented to his mother in a ceremony on Wednesday, 4 July 1945 in Tiger Stadium, Massillon, Ohio. The USS Epperson (DD-719), a Gearing-class destroyer, was named in his honor. When the 1st Battalion, 105th Infantry Regiment came under attack from a much larger enemy force on 7 July, Lieutenant Colonel William O'Brien refused to leave the front lines even after being wounded, and continued to lead his men until being overrun and killed. He was posthumously awarded the Medal of Honor on 9 May 1945, for his actions throughout the battle for Saipan. The U.S. Army ship USAT Col. William J. O'Brien, which served in the Pacific Ocean at the end of World War II, was named in his honor. On 7 July, Private Thomas A. Baker and his comrades from the 1st Battalion, 105th Infantry Regiment, came under attack by a large Japanese force. Although seriously wounded early in the attack, he refused to be evacuated and continued to fight in the close-range battle until running out of ammunition. When a comrade was wounded while trying to carry him to safety, Baker insisted that he be left behind. At his request, his comrades left him propped against a tree and gave him a pistol, which had eight bullets remaining. When American forces retook the position, they found the pistol, now empty, and eight dead Japanese soldiers around Baker's body. 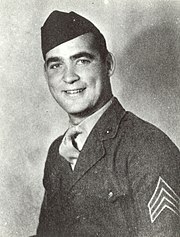 Baker was posthumously promoted to sergeant and, on 9 May 1945, awarded the Medal of Honor for his actions throughout the battle for Saipan. He was buried at Gerald B. H. Solomon Saratoga National Cemetery in Schuylerville, New York. On 7 July 1944, Army Captain Ben L. Salomon, the battalion dentist of 2nd Battalion, 105th Infantry Regiment, 27th Infantry Division aided the evacuation of wounded soldiers. After defending his unarmed patients from four Japanese soldiers, he manned a machine gun post and effectively repelled numerous enemy forces to enable the evacuation of wounded personnel. When his body was recovered after the battle, 98 dead Japanese soldiers were found in front of his position. For gallantry in battle, Captain Ben L. Salomon was posthumously awarded the Medal of Honor in May 2002. Salomon was the third Jewish service member to be awarded the Medal of Honor during World War II. PFC Guy Gabaldon, of Headquarters and Service Company, 2nd Marine Regiment, 2nd Marine Division, was a Mexican-American from Los Angeles. He is officially credited with capturing more than 1,000 Japanese prisoners during the battle. PFC Gabaldon, who was raised by Japanese-Americans, used a combination of street Japanese and guile to convince soldiers and civilians alike that U.S. troops were not barbarians, and that they would be well treated upon surrender. For his outstanding bravery, which earned him the nickname, "The Pied Piper of Saipan," Gabaldon received a Silver Star, which was upgraded to the Navy Cross. During the war, his commanders had requested that he receive the Medal of Honor for his actions; however, his initial award was the Silver Star. In 1998, efforts were re-initiated to secure the Medal of Honor for PFC Gabaldon. The effort was ongoing in 2006. Although major fighting had officially ceased on 9 July, pockets of Japanese resistance continued. In September 1944, U.S. Marines began patrols into the island interior in order to bring in civilians and soldiers still holding out in the jungles. A group led by Captain Sakae Oba managed to evade capture for more than 512 days until surrendering to American forces on 1 December 1945, three months after the official surrender of Japan. In February 2011, a film about Oba, Oba: The Last Samurai, was released in Japan. With the capture of Saipan, the American military was now only 1,300 mi (1,100 nmi; 2,100 km) away from the home islands of Japan. The victory would prove to be one of the most important strategic moments during the war in the Pacific Theater, as the Japanese mainland was now within striking distance of United States' B-29 bombers. From this point on, Saipan would become the launch point for retaking other islands in the Mariana chain and the invasion of the Philippines in October 1944. Four months after capture, more than 100 B-29s from Saipan's Isely Field were regularly attacking the Philippines, the Ryukyu Islands and the Japan mainland. In response, Japanese aircraft attacked Saipan and Tinian on several occasions between November 1944 and January 1945. The U.S. capture of Iwo Jima (19 February – 26 March 1945) ended further Japanese air attacks. The loss of Saipan was a heavy blow to both the military and civilian administration of Japanese Prime Minister Hideki Tōjō. According to one Japanese admiral: "Our war was lost with the loss of Saipan." U.S. Marine Corps General Holland Smith said: "It was the decisive battle of the Pacific offensive [...] it opened the way to the Japanese home islands." Shortly after Saipan was taken, a meeting at the Imperial General Headquarters was convened where it was decided that a symbolic change of leadership should be made: Tōjō would step aside and Emperor Hirohito would have less involvement in day-to-day military affairs, even though he was defined as both head of state and the Generalissimo of the Imperial Japanese Armed Forces according to the Meiji Constitution of 1889. The general staff believed it was now time to distance the Imperial family from blame as the tide of war turned against the Japanese. Although Tōjō agreed to resign, Hirohito blocked his resignation because he considered Tōjō to be Japan's strongest war leader. But after Tōjō failed to shuffle his Cabinet due to excessive internal hostility, he conceded defeat. On 18 July, Tōjō again submitted his resignation, this time unequivocally. His entire cabinet resigned with him. Former IJA General Kuniaki Koiso became Prime Minister on 22 July. However, due to the legacy of Saipan, Koiso was nothing more than a titular Prime Minister, and was prevented by the Imperial General Headquarters from participating in any military decisions. Saipan also saw a change in the way Japanese war reporting was presented on the home front. Initially, as the battle started, Japanese accounts concentrated on the fighting spirit of the IJA and the heavy casualties it was inflicting on American forces. However, any reader familiar with Saipan's geography would have known from the chronology of engagements that the U.S. forces were relentlessly advancing northwards. 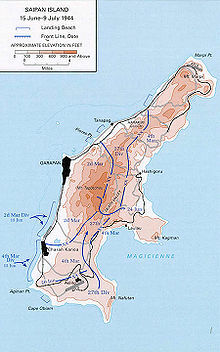 No further mention of Saipan was made following the final battle on 7 July, which was not initially reported to the public. However, after Tōjō's resignation on 18 July, an accurate, almost day-by-day, account of the defeat on Saipan was published jointly by the Army and Navy. It mentioned the near total loss of all Japanese soldiers and civilians on the island and the use of "human bullets". The reports had a devastating effect on Japanese opinion; mass suicides were now seen as defeat, not evidence of an "Imperial Way". This was the first time Japanese forces had accurately been depicted in a battle since Midway, which had been proclaimed a victory. After the war concluded, apologists for Hirohito asserted that the order encouraging the civilians of Saipan to commit suicide for benefits in the afterlife had in fact been forged, along with other incriminating orders. Historian David Bergamini considers this unlikely, writing that "half the staff of the palace [...] would have felt obliged to cut open their bellies if the sacred seals of the Throne had ever been misapplied." Suicide Cliff and Banzai Cliff, along with a number of surviving isolated Japanese fortifications, are recognized as historic sites on the U.S. National Register of Historic Places. The cliffs are also part of the National Historic Landmark District Landing Beaches; Aslito/Isley Field; & Marpi Point, Saipan Island, which also includes the American landing beaches, the B-29 runways of Isley Field, and the surviving Japanese infrastructure of the Aslito and Marpi Point airfields. The American Memorial Park on Saipan commemorates the U.S. and Mariana veterans of the Mariana Islands campaign. The novel Away All Boats, from which a film was made, was based on the author's personal experiences on an attack transport. One long section gives a very detailed account of the battle as seen by the crew members both on board and on shore. The film Oba: The Last Samurai depicted the last banzai charge of the Japanese during the war, and the holdout of Captain Sakae Ōba. The novel Debt of Honor by Tom Clancy begins with a character purchasing land on Saipan near the Banzai Cliff where his parents and siblings jumped to their deaths. Saipan features heavily in the rest of the novel. ^ Beevor, Antony (2012). The Second World War (1 ed.). New York: Back Bay Books. ISBN 978-0-316-02375-7. ^ Miller, Donald L. (2001). The Story of World War II. New York: Simon & Schuster. ISBN 978-0-7432-2718-6. ^ a b c Beevor, Antony (2013). The Second World War (in Norwegian) (1st ed.). Cappelen Damm. p. 611. ISBN 978-82-02-42146-5. ^ "Battle of Saipan". Historynet.com. ^ Rottman 2004, p. 90. ^ Rottman 2004, p. 91. ^ "U.S. Army in World War II: Campaign in the Marianas, Ch. 5". United States Army Center of Military History. Retrieved 13 October 2006. ^ Video: Allies Liberate Island of Elba Etc. (1944). Universal Newsreel. 1944. Retrieved 21 February 2012. ^ "Selected June Dates of Marine Corps Historical Significance". This Month in History. History Division, United States Marine Corps. Archived from the original on 31 October 2006. Retrieved 7 June 2006. ^ Harold Goldberg, D-Day in the Pacific: The Battle of Saipan, Indiana University Press, 2007. pp. 160–164. ^ Harold Goldberg, D-Day in the Pacific: The Battle of Saipan, Indiana University Press, 2007. pp. 167–194. ^ John Toland, ibid, p. 519. ^ Zec, Donald. Marvin: The Story of Lee Marvin. New York: St. Martin's Press, 1980, ISBN 0-312-51780-7, pp. 36–39. ^ a b c d e f g h Bergamini, David (1971). Japan's Imperial Conspiracy. New York: William Morrow and Company, Inc. pp. 1012–1014. ^ "NHL nomination for Landing Beaches; Aslito/Isley Field; & Marpi Point, Saipan Island". National Park Service. Retrieved 14 April 2015. ^ "Private First Class EPPERSON, HAROLD GLENN, U.S. Marine Corps". Retrieved 2 April 2011. ^ "Medal of Honor recipients - World War II (A–F)". United States Army Center of Military History. 3 August 2009. Retrieved 5 December 2009. ^ "Battle of Saipan". Claim to Fame: Medal of Honor recipients. Find a Grave. Retrieved 18 February 2008. ^ "Captain SALOMON, BEN L., U.S. Army". Retrieved 2 April 2011. ^ Burlas, Joe (24 September 2004). "Pentagon salutes military service of Hispanic World War II veterans". Army News Service. Archived from the original on 20 January 2005. Retrieved 24 March 2006. ^ Burbeck, James (1998). "An Interview with Guy Gabaldon". War Times Journal. Archived from the original on 13 March 2006. Retrieved 6 March 2006. ^ "PFC Guy Gabaldon, WWII, The Pacific". America USA. Archived from the original on 11 February 2006. Retrieved 6 March 2006. ^ Frank, Richard B. (2001). Downfall: The End of the Imperial Japanese Empire. Penguin. pp. 90–91. ISBN 0-14-100146-1. Bright, Richard Carl (2007). Pain and Purpose in the Pacific: True Reports Of War. Trafford Publishing. ISBN 1-4251-2544-1. Denfeld, D. Colt (1997). Hold the Marianas: The Japanese Defense of the Mariana Islands. White Mane Pub. ISBN 1-57249-014-4. Gailey, Harry A. (1986). Howlin' Mad Vs. the Army: Conflict in Command, Saipan 1944. Presidio Press. ISBN 0-89141-242-5. Goldberg, Harold J. (2007). D-day in the Pacific: The Battle of Saipan. Indiana University Press. ISBN 0-253-34869-2. Jones, Don (1986). Oba, The Last Samurai. Presidio Press. ISBN 0-89141-245-X. Manchester, William (1980). Goodbye, Darkness A Memoir of the Pacific War. Boston – Toronto: Little, Brown and Co. ISBN 0-316-54501-5. Morison, Samuel Eliot (2001). New Guinea and the Marianas, March 1944 – August 1944, vol. 8 of History of United States Naval Operations in World War II (reissue ed.). Champaign, Illinois, US: University of Illinois Press. ISBN 0-252-07038-0. O'Brien, Francis A. (2003). Battling for Saipan. Presidio Press. ISBN 0-89141-804-0. Petty, Bruce M. (2001). Saipan: Oral Histories of the Pacific War. McFarland and Company. ISBN 0-7864-0991-6. Rottman, Gordon; Howard Gerrard (2004). Saipan & Tinian 1944: Piercing the Japanese Empire. Osprey Publishing. ISBN 1-84176-804-9. Sauer, Howard (1999). "Torpedoed at Saipan". The Last Big-Gun Naval Battle: The Battle of Surigao Strait. Palo Alto, California: The Glencannon Press. ISBN 1-889901-08-3. – Firsthand account of naval gunfire support by a crewmember of USS Maryland. Chapin, Captain John C. (1994). The Battle for Saipan. Washington D.C.: United States Marine Corps Historical Division. PCN 19000312300. Archived from the original on 11 December 2008. Retrieved 12 December 2008. Chen, C. Peter. "The Marianas and the Great Turkey Shoot". World War II Database. Retrieved 31 May 2005. Saipan – a 2nd Marine Division pamphlet describing certain expected features of the invasion and combat, including the presence of a large civilian population. Banzai charge in Saipan: Gyokusai (in Japanese) Suicide for the Emperor? Hoffman, Major Carl W. (1950). "Saipan: The Beginning of the End". USMC Historical Monograph. Historical Branch, United States Marine Corps. Retrieved 19 December 2005. Anderson, Charles R. (2003). Western Pacific. U.S. Army Campaigns of World War II. United States Army Center of Military History. CMH Pub 72-29. Retrieved 3 November 2004. Dyer, George Carroll (1956). "The Amphibians Came to Conquer: The Story of Admiral Richmond Kelly Turner". United States Government Printing Office. Archived from the original on 21 May 2011. Retrieved 5 May 2011. 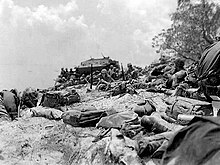 Wikimedia Commons has media related to Battle of Saipan.